I’m not even a dog person. Amazing. That’s my favourite. Nor am I! I’m a people puppy. A really good boy! Am I good boy? I am! I am! I am! O love the way you say that, it’s so funny! It’s the best fun ever being your dog. You’re the best owner I’ve ever had. I was given my grand-dad’s lifetime treasured Christmas present, a couple of years ago; an audio recording of ‘You’re not my dog’ with some of your ‘Where Earwigs Dare’ hound, potato and bovine tributes. My grand-daughters- in Totnes, Rosie 7 and Martha 5, defined your work in the most fitting way ! I am reminded of you today having see Little Soldier Comapny in ‘Journey to the Impossible’. Thanks Matt -maybe see you one day, in Paris or Totnes ! Thank you Andy, great to get your message – warmed the cockles (& the crocodiles) of my heart. I’d love to hear that audio one day! I read your article in the October “Resurgence” magazine – “The thing is – but where?’ and I particularly liked the idea of blank sheets of paper not having a shallow end. Jumping in can be dangerous. 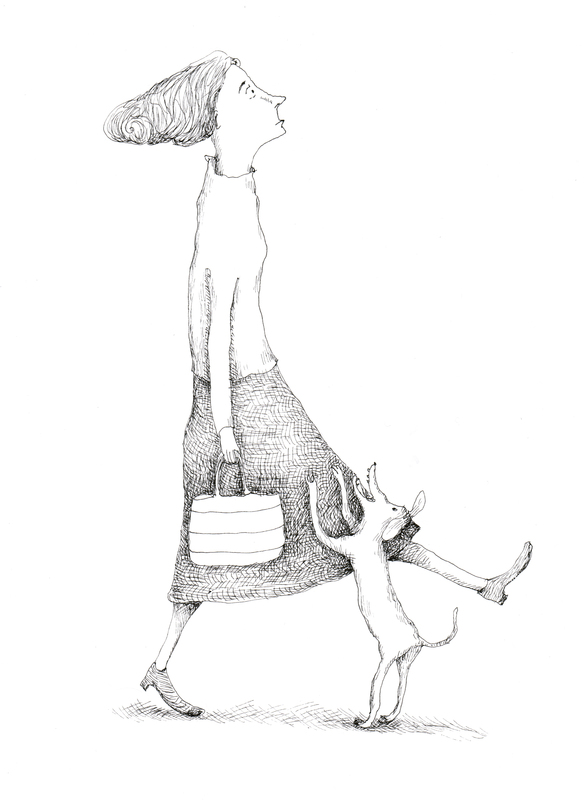 Needless to say, I liked your poem very much and Claudia Schmid’s perfect illustration. Thank you for writing it. Thank you both. ps I hope the lady took in the dog.